Mautner felt that burning pain in his chest get stronger and then the F-15’s shrill stall warning alarm jerked him back to reality. He had set the throttle too low and with insufficient air flowing across his wings to generate lift, Mautner’s Eagle was about to fall from the sky. He was still flying west and away from Jerusalem when instinctively he pumped up the power. Executing a wide turn, he headed back to the old city as his jet began climbing to its launch altitude. On the left display screen in his cockpit, Mautner called up his ordinance stores. Cycling through the various air-to-air missiles and ground attack munitions at his disposal, he selected a single GBU-15 and pressing a button, he armed his chosen weapon. Then keying in his digital map on his right display, Mautner moved the curser to his target and highlighted it. An invisible infrared beam locked on and began ‘painting’ his objective. He was now approximately nine nautical miles from the Dome and had reached his minimum launch height of 8,000 metres for a shallow angle of attack. His weapon’s computer which was calculating continuously his speed, altitude and range to the target, then told him it was time. In his digital Heads-up Display, the word ‘FIRE’ flashed in green and without hesitation, Mautner hit the pickle button releasing the 900kg weapon. The unpowered bomb fell silently from its rails and began gliding towards its mark following the jet’s infrared targeting beam. Steering to port while still ‘painting’ the target, Mautner held his breath and began counting down the seconds to impact. Sensors in the weapon instantly began making their final corrections adjusting the angle of the bomb’s tail fins to guide it to its target. Against the night’s sky, the falling GBU was silent and virtually invisible to anyone watching from the ground. Its flight was short, lasting only 23 seconds. The Guided Bomb Unit, GBU-15, impacted at a low angle, striking just below the golden dome. This weapon had been designed specifically to destroy buildings and reinforced military structures. As it penetrated the outer wall, the bomb detonated its payload of high explosives. The massive concussion generated within the confines of the Dome, blasted apart its walls and shattered its support columns. With the main bulk of the shockwave directed upwards and outwards, the sacred bedrock on which the shrine had been built remained virtually undamaged. The blinding flash of the explosion lit up the night sky. Mautner’s jet was rocked by the pressure wave of the blast as he overflew his target. He swung his Strike Eagle around to make another pass and survey the damage. Amidst the smoke, a large gaping hole in the ground was all that remained of the golden dome and the walls it supported. In mere seconds, Mautner had just demolished the historic Dome of the Rock – one of the most sacred and recognisable shrines in the world. 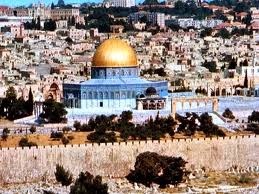 The Dome of the Rock (left), a revered Muslim shrine towers like a beacon over the ancient city of Jerusalem. Known to Arabs as the Qubbat As-Sakhrah, it occupies a prime position on the revered Temple Mount. Muhammad ascended to heaven from this very spot accompanied by the Archangel Gabriel. 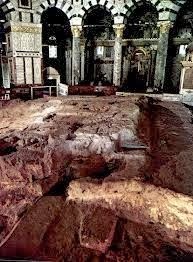 Jews believe that this was the spot where Abraham stood ready to sacrifice his only son to God as a testament of his faith. Christians too see this rock outcrop and the Temple Mount itself as being of great religious significance for this was once the site of the Second Temple of Solomon where Jesus as a baby was brought to and where he later preached shortly before his death. The First Temple built by King Solomon took seven years to construct on this ancient hill and was completed in 957 BC. It stood for about 400 years before it was destroyed by King Nebuchadnezzar II of Babylon in 586 BC. The Second Temple built on the same spot, was completed in 515 BC. Later King Herod the Great enlarged the building and created the famous Western Wall which is also known as the Wailing Wall, one of the most prominent sites in the Jewish faith. Over the next two centuries, the Jews revolted twice against the oppressive rule of their Roman overlords who finally ordered its army to demolish the Second Temple in 70 AD. The Dome of the Rock, the first Muslim masterpiece, was built some 600 years later in 687 AD by Caliph Abd al-Malik, half a century after the death of the Prophet Muhammad. And there it has continued to stand defiantly on what the Muslims, Jews and the Christians regard as a holy place central to their respective faiths. 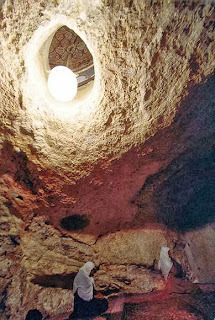 Under the Foundation Stone lies the Well of Souls, a natural cave said to once house the iconic Ark of the Covenant and other biblical treasures lost to history. The Waqf, an Islamic council that controls access to the Dome of the Rock has long forbidden archaeological excavations, which it views as an unthinkable desecration. With the exception of some clandestine surveys of caves, cisterns and tunnels undertaken by European adventurers in the late 19th century along with some minor archaeological work conducted by the British from 1938 to 1942 when the Al-Aqsa Mosque was undergoing renovation, the layers of history hidden beneath the Temple Mount have remained tantalizingly out of reach. But even as Israeli troops protected this Muslim shrine, secret Jewish organisations have been preparing quietly for decades to reclaim this holy site which they felt was rightfully theirs. The Torah promises that the Third Temple of Solomon would be built one day and it would herald the End Times. In Advent the work of one fictitious organisation known as the Sons of Solomon is described. Over the years, its members which included architects, religious scholars, bankers, several high-ranking government officials, military officers and hundreds of wealthy and devoted supporters had painstaking drawn up detailed construction plans for a Third Temple based on the descriptions in the Torah and the Bible. The had cut and prepared the stone blocks for the temple ready for use at a moment's notice. Ancient religious garbs were also carefully recreated right down to the precious stones of the High Priest's breastplate by its sister organisation - the Daughters of Solomon. Will this temple ever be rebuilt? As recently as March 2013 in an article in the Jewish Press, a Muslim writer suggested that Muslims to work with their Jewish neighbours to rebuild the Third Temple of Solomon close to the Dome of the Rock on the Temple Mount. In July 2013 Israeli cabinet minister Uri Ariel, the Israeli minister of Housing and Construction, similarly called upon his government to initiate the rebuilding of the temple. June 15 2017: DM BOOKS publishes Unsung Heroes written by Eleanor Nunis. January 15 2016: Select Books in Singapore is retailing print copies of DutyBound. Details here. 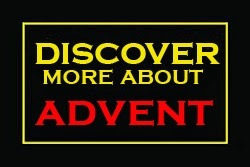 November 17 2015: Print copies of Advent can be ordered here. July 2015: Interview in the NewEurasian magazine. April 25 2015: Print copies of DutyBound can be ordered here. April 13 2015: Media report in Lianhe Zaobao on launch of DutyBound at the Senior Police Officers' Mess. January 22 2015: Bahau, the Elephant & the Ham is now available in print. Click here. December 18 2014: How cool is this - a review of DutyBound by The Online Citizen. November 30 2014: Bahau, the Elephant & and the Ham is now available as an ebook. November 19, 2014: Finally after nine long months, the ebook version of DutyBound has been published. A Print-on-Demand version will follow shortly. September 21, 2013: Advent can be purchased as an ebook download from Smashwords and Barnes and Noble. A former newspaper correspondent and managing editor for a number of magazines in Singapore, David Miller has written several commercial books over the years. His first novel Year of the Tiger was published in August 2012. Advent was his second novel published in June 2013. Copyright David Miller 2012. Awesome Inc. theme. Powered by Blogger.